To see traveler tips, where to stay, photos, and other tourist information, go to the Barcelos custom trip planner. Cape Town, South Africa to Barcelos is an approximately 22.5-hour flight. Traveling from Cape Town to Barcelos, you'll gain 2 hours due to the time zone difference. In May, daily temperatures in Barcelos can reach 23°C, while at night they dip to 13°C. You will leave for Barcelona on the 24th (Wed). Get in touch with nature at La Barceloneta and Sailing Experience Barcelona. Kids will enjoy PortAventura World and Park Güell. And it doesn't end there: admire the striking features of La Sagrada Familia, pause for some serene contemplation at Barcelona Cathedral, make a trip to Casa Amatller, and take a stroll through El Barri Gòtic. For photos, where to stay, reviews, and other tourist information, read Barcelona vacation trip planner. Explore your travel options from Barcelos to Barcelona with the Route module. The time zone difference when traveling from Barcelos to Barcelona is 1 hour. In May in Barcelona, expect temperatures between 25°C during the day and 17°C at night. Finish your sightseeing early on the 29th (Mon) so you can travel to San Vito lo Capo. A vacation in San Vito lo Capo offers a chance to enjoy a sheltered bay and a town with distinctive Arab-Norman architecture. You'll enjoy a bit of beach vacationing at Spiaggia di San Vito lo Capo and Spiaggia di Macari. Change things up with a short trip to Riserva Naturale Orientata dello Zingaro in Castellammare del Golfo (about 38 minutes away). For other places to visit, ratings, reviews, and tourist information, use the San Vito lo Capo holiday planner. Traveling by combination of flight and car from Barcelona to San Vito lo Capo takes 4 hours. Alternatively, you can take a bus; or do a combination of ferry, train, and bus. In May, plan for daily highs up to 26°C, and evening lows to 19°C. 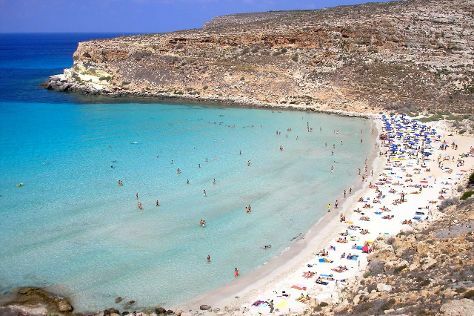 Wrap up your sightseeing on the 1st (Thu) to allow time to travel to Lampedusa. Italy's southernmost territory, Lampedusa, is known for its turquoise waters, white-sand beaches, and island charm. Start off your visit on the 1st (Thu): stop by Il Pescato di Lampedusa and then kick back and relax at Spiaggia dei Conigli. Get ready for a full day of sightseeing on the next day: admire nature's wide array of creatures at Centro di Recupero Tartarughe e Fauna Selvatica WWF and then kick back and relax at Spiaggia Attrezzata di Cala Fiato Perduto. For ratings, maps, photos, and tourist information, go to the Lampedusa vacation planner. Traveling by combination of car and flight from San Vito lo Capo to Lampedusa takes 2.5 hours. Alternatively, you can do a combination of bus, train, and ferry. Expect a daytime high around 29°C in June, and nighttime lows around 24°C. Wrap up your sightseeing by early afternoon on the 3rd (Sat) to allow enough time to travel to Rome. Il Pescato Di Lampedusa S.A.S. Di Costa Antonino & C.
Step off the beaten path and head to Palatine Hill and Roman Forum. Kids will appreciate attractions like Colosseum and Trevi Fountain. There's still lots to do: make a trip to Pantheon, admire the masterpieces at Borghese Gallery, appreciate the extensive heritage of Piazza Navona, and pause for some serene contemplation at St. Peter's Basilica. To find ratings, where to stay, traveler tips, and more tourist information, read our Rome sightseeing planner. Traveling by combination of flight and train from Lampedusa to Rome takes 5 hours. Alternatively, you can do a combination of ferry and train; or do a combination of ferry and bus. Traveling from Lampedusa in June, expect nights in Rome to be slightly colder, around 20°C, while days are somewhat warmer, around 33°C. Finish up your sightseeing early on the 7th (Wed) so you can catch the train to Milan. Eschew the tourist crowds and head to Galleria Vittorio Emanuele II and Piazza del Duomo. Family-friendly places like Lido di Faggeto Miamilaryo and Duomo di Milano will thrill your kids. 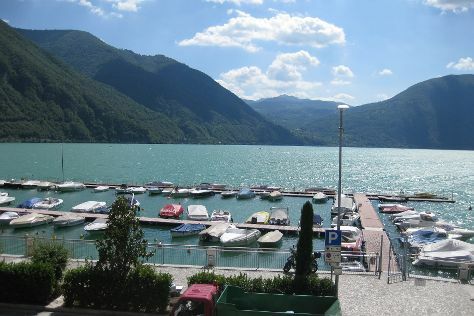 You'll find plenty of places to visit near Milan: Como (Cathedral of Como (Duomo) & L'Isola Che Non C'e') and Turati Centro Nautico Lario (in Argegno). For maps, reviews, traveler tips, and tourist information, use the Milan trip itinerary planner. Getting from Rome to Milan by train takes about 3 hours. Other options: do a combination of train and flight; or drive. In June, plan for daily highs up to 32°C, and evening lows to 20°C. Finish your sightseeing early on the 10th (Sat) to allow enough time to travel to Lugano. On the 11th (Sun), don't miss a visit to Convento dei Cappuccini and then enjoy some diversion at Lido di Lugano. To see traveler tips, where to stay, more things to do, and other tourist information, you can read our Lugano sightseeing planner. Drive from Milan to Lugano in 1.5 hours. In June, plan for daily highs up to 30°C, and evening lows to 18°C. Wrap up your sightseeing on the 11th (Sun) early enough to travel to Zurich. Discover out-of-the-way places like Mt Pilatus and Dying Lion of Lucerne Monument. Take a break from the city and head to Lake Zurich and Lake Lucerne. Change things up with a short trip to Chapel Bridge (Kapellbrucke) in Lucerne (about 40 minutes away). Next up on the itinerary: admire the masterpieces at Museum Rietberg, wander the streets of Bahnhofstrasse, make a trip to Grossmunster, and tour the pleasant surroundings at Old Botanical Garden. To see maps, reviews, ratings, and other tourist information, refer to the Zurich travel itinerary creator. You can fly from Lugano to Zurich in 2.5 hours. Alternatively, you can drive; or take a train. In June, Zurich is little chillier than Lugano - with highs of 27°C and lows of 14°C. Cap off your sightseeing on the 15th (Thu) early enough to travel to Pyrgos. Escape the urban bustle at Agia Marina Beach and Palouki beach. Step off the beaten path and head to Kourouta Beach and Olympia. Step out of Pyrgos with an excursion to Chlemoutsi in Katakolo--about 36 minutes away. For photos, reviews, maps, and tourist information, refer to the Pyrgos trip planner. The Route module can help you plan travel from Zurich to Pyrgos. The time zone changes from Central European Time to Eastern European Time, which is usually a 1 hour difference. In June, Pyrgos is somewhat warmer than Zurich - with highs of 33°C and lows of 19°C. Finish your sightseeing early on the 18th (Sun) so you can travel back home. MERCOURI ESTATE S.A. - ΚΤΗΜΑ ΜΕΡΚΟΥΡΗ Α.Ε.